Can we trust the ‘Gang of Eight’ to stand firm on their Border Security, Economic Opportunity and Immigration Modernization Act of 2013 and not give in to Open Borders or amnesty to 11 Million illegals. For your reading I have enclosed an outline and the full text of the bill below. Rubio is being mocked, ridiculed for standing for what he believes is true. No matter that in the end Obama will probably have his way. We know what Obama wants, he may say he wants amnesty for the illegals or undocumented aliens that are here, but what he wants is more chaos, more hate to destroy the Republican Party. And conservatives are willingly assisting Obama to destroy Rubio. We are intent in destroying our own. Don’t we have the Left to do this? Obama must be smiling smugly that the carnivorous conservatives are eating their own, just like we did in the 2012 primaries. It still amazes me how intelligent Christians, conservatives and Republicans can get so many issues correct but can’t seem to grasp the complexities of the immigration system. We all know the system is not functioning as it should and that we in essence have a ‘de facto’ immigration system. As far as I am concerned, we have a few conservative men in the senate who are willing to stand up for what they believe, Senator Ted Cruz, Senator Rand Paul, Senator Mike Lee and Senator Marco Rubio. Please understand that the Left will systematically destroy one by one if we give them an opportunity. We should not let the nefarious Left destroy our senators. 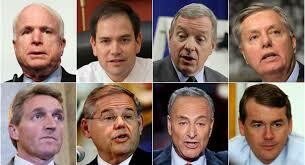 We may or may not agree totally with these senators, but I believe that they care for America and Americans. I receive hundreds of emails daily addressing many issues, but of late I have received mostly emails on immigration. Instead of using venom pointed toward our GOP, why not use that energy in a more productive manner. First be knowledgeable about what you are writing. That is, before making a statement, read the bill. Understand the terminology. Making comments without understanding the terminology is ridiculous and downright stupid. AMNESTY: Law. an act of forgiveness for past offenses, especially to a class of persons as a whole. MISDEMEANOR: Law. A criminal offense defined as less serious than a felony. It is an offense punishable by confinement to jail or fined or both. If a fine is paid or jail time served, then compliance with the law has been satisfied. FELONY: a serious crime for which you can be sentenced to prison. What the bill is doing is modernizing our immigration system to a system that can be monitored. We must know who is in our country. We must know which illegals need to be sent back to their country. We must address the economy crises we are in and we must stop being in denial. How many American young adults ages 18 – 25 are willing to do hard labor? Who will pick our cotton, our bell peppers, fruit, etc? Who will frame and build our houses? Who will wash dishes and prepare our meals at our favorite restaurant? Who will change the linens and clean after us after we leave the hotel? Who will care for the elderly at the nursing homes? Who? The American Dream belongs to anyone who is willing to work hard, to follow our laws and be abiding citizens. It does not belong to any one ethnic group or race. It belongs to all of us. A misdemeanor does not make you a criminal and should not be a detriment in obtaining a job. With Battleground Texas on our heels we can not be complacent or underestimate what the Obama Administration is doing to make sure that Texas turns Blue in 10 years. We must act NOW. 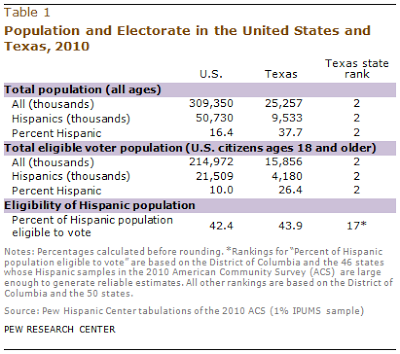 According to the Pew Hispanic Research Center dated October 1, 2012, numbers taken from the 2010 census, there are 4.2 million Hispanic eligible voters in Texas. Remember we are not out there knocking on doors as we should but Battleground Texas is. Granted if the Left gets to these eligible voters first, well you know how they will vote. There is no guarantee how our officials choose once they chase and gain our vote. We must get out the vote to all eligible voters in Texas. Texas is not a Battleground state, therefore there are no statistics for Texas. We don’t want to become a Battleground state. We in the Republican Party have to stand strong behind our moral values and our constitution. I am NOT for blanket amnesty or Open Borders. I totally agree with Senator Ted Cruz that we have to stand by the rule of law, so does Rubio. As far as I understand this bill with fines and a waiting period is NOT giving amnesty to 11 million plus illegals. This is where the difference of opinions lies. After reading the text of the bill, if you do not agree or have a better idea, please contact your Senator or the Republican senators who worked on the bill. Let your voice be heard! Once granted Registered Provisional Immigrant status, they can work for any employer in the U.S. RPI status lasts for six years, and is renewable. Individuals with RPI status aren't eligible for federal means-tested public benefits, such as food stamps. After 10 years, immigrants with RPI status will be eligible for lawful permanent resident status, as long as they meet the conditions that other immigrants must meet in order to receive a green card, including knowledge of civics and English. They also must pay a $1,000 penalty. Legal status and green cards will not be granted to most undocumented immigrants unless certain border security benchmarks are met. The bill calls for additional Border Patrol agents, drones and other surveillance systems along the U.S.-Mexico border, and additional fencing there. Immigrants who are in the U.S. illegally can apply for legal status if they have lived in the U.S. since Dec. 31, 2011, and haven't been convicted of a felony or three or more misdemeanors. They must pay a $500 penalty and back taxes. Within five years, all employers will be required to use the federal government's Internet-based E-Verify system to check the eligibility of new hires to work in the U.S. This requirement will be phased in, starting with large businesses. Every non-citizen will be required to show a photo ID that matches the photo on file with the government. The H-1B visa cap will be increased from 60,000 to 110,000. This cap could go as a high as 180,000 depending on demand. The exemption for advanced degree holders from U.S. universities will be increased from 20,000 to 25,000. A new three-year W-Visa classification would be crated for low-skilled workers. An independent statistical agency would determine how many W visas would be granted, and in what occupations, based on need. Employers who want to use these visas must submit applications to the government. Employers with workplace violations are ineligible for these visas. Foreign entrepreneurs who want to start a business in the U.S. would be granted visas.